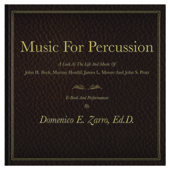 This percussion teaching aid is both an audio CD and e-book. Congratulations on a very fine addition to percussion pedagogy. I enjoyed reading the bios and interviews of the 4 authors and listening to your performances. You obviously put a lot of time and work into compiling these materials. The layout is very good and well organized for easy reference. The visual presentation in the pdf is clear and attractive. Your interview questions are very good and I found the extensive answers by the authors the most interesting... You present a nice human portrait of each author through the interviews and this should be valuable to researchers, and your annotated analysis should be very helpful to students and future performers of the works. You chose good representative works for each composer and the quality of the recordings are very good. Again, congratulations on a fine addition to percussion pedagogy. (Gary Cook, Retired Professor of Percussion - University of Arizona, Timpanist â€“ Tucson Symphony, Former President Percussive Arts Society).